There's a lot of emotion in these pictures for me. I hope they stir emotion in you too. Before I scare anyone, this is makeup. 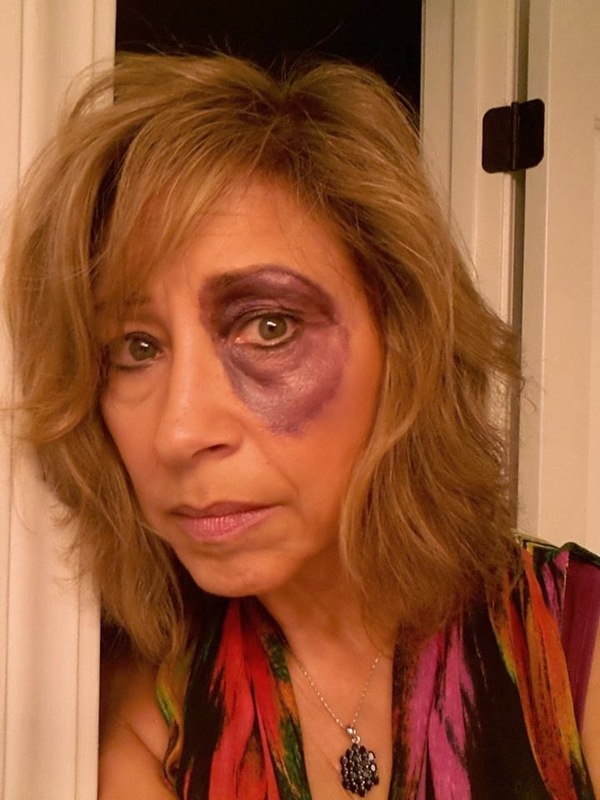 But I hope you had a strong emotional reaction to seeing these pictures because bruises are not pretend for many victims of domestic violence. I love this picture at the top because the downcast expression conveys what I used to feel so often; despair and hopelessness. As many of you know, I endured a lot of abuse in my first marriage. From the age of 16 until the age of 43, I was emotionally and verbally abused almost continuously. Sometimes there was also physical violence. There would be physical intimidation including being knocked to the floor and being hit in the face with an open hand. But the emotional abuse was so much worse and left nothing visible. Those wounds were to my soul. I never suffered injuries requiring medical attention and I never looked like these pictures. But the violence I did experience was always intimidating and at times frightening. The first time -- at 16 -- was really scary. That first time was the only time my abuser drew his clenched fist back as if he was just about to punch me in the face (while he held me against the wall). He did this to me because I wasn't looking at him while he was lecturing me. He was a whole foot taller than me and more than twice my weight. I had never seen rage like that in anyone. But I would see it many times over the next 27 years. Once something like that happens -- and it only has to happen once -- you are not sure when it's coming again. 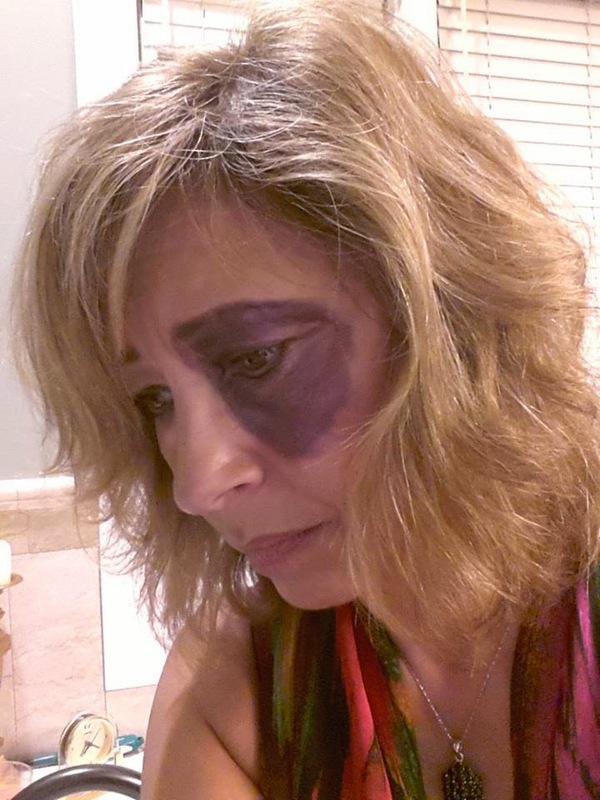 My abuser had a hair-trigger temper. It didn't take a lot to set him off. And many times he was just looking for a fight even without an offense. When all you want is to avoid conflict and someone delights in taunting and antagonizing you, it wears you out emotionally. And sometimes you just lose it. I know I did. 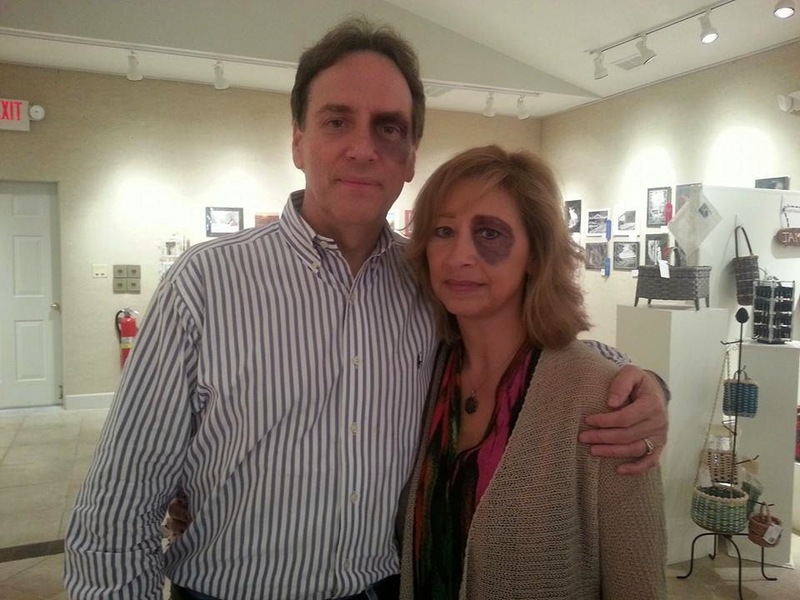 The reason for my black eye tonight (and John's below) is the social media campaign we were invited to be a part of. I can't wait to see the finished video. It will premiere Saturday evening, October 11, at The 24th Annual Women's Resource Center Candlelight Vigil in Beckley, WV. The public is invited and it is free of charge. I am the keynote speaker. 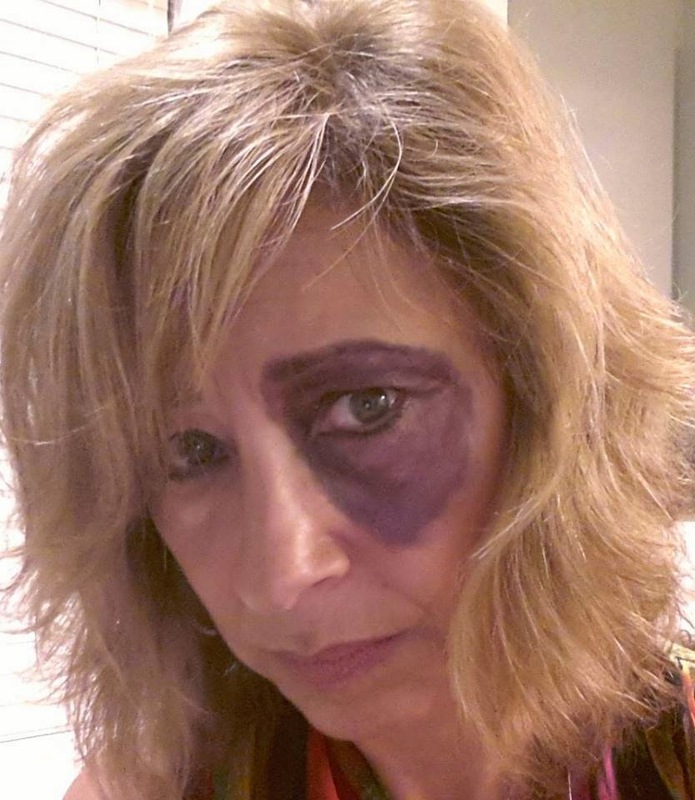 "Her black eye is OUR black eye." Before washing my face, I took some additional pictures with my phone. I felt such a connection with other abused women through this experience and these pictures. I wasn't in any hurry to wash the makeup off. But John seemed visibly relieved when I did. I told him I was going to use one of these photos for my profile picture on Facebook for the rest of October. He looked pained. I posted the new profile pic and added a caption almost immediately. But for a minute or two, there was just the image and no explanation. Even after I did add a caption, the reactions were (I must confess) exactly what I wanted. I was going for the shock value and I wanted Facebook friends to be afraid for me -- even if only for a second or two. Someone who has never lived this way can't ever fully imagine what it feels like. I don't have to imagine. I remember. The man I'm married to today would never hurt me. Not physically or emotionally. He values me. He respects me. And he truly loves me. I'm blessed with a happy ending. And because I have been given much, I believe much is required of me. Speaking at an event, donating proceeds from my books, offering myself or my time, being made up for a social media campaign; these are all small ways I can help. How can you help end domestic violence? Surely there is something small that you can also do. I'm asking you to think about it. Then do something. I am a victim but I am also a victimizer. I was abused and because I didn't get the proper care and counselling, I ended up hurting the next guy I was with. I became my abuser. One thing I realized is that it is not just women who are abused. Sometimes, the men are also abused and unfortunately, they can't tell anyone because its not normal. Thanks for posting this. I haven't really posted about my own story. I still don't have the words for it. Unlike you, I was exactly that woman in your photo. I was the one wearing shades at night, long sleeves in this tropical country I live in, and the one who almost got killed. Kathy, you are very brave to share both sides of your story. I can tell you from my experience that writing about and sharing my story have been more therapeutic and healing than I anticipated. Some people thought it was "bold" of me to share these photos. For me, it seems like an obvious way to get people's attention. It didn't feel bold to me at all. But maybe that's because I've already done the boldest things I could ever do in writing my books about abuse. I will never regret sharing my story. It has been 100% liberating and healing. You will find your voice. And I'll be waiting to read when you do. Thanks for your comment! Thank you for reading and commenting, Omowunmi!